Every day you can go visit the pumpkin king himself; Jack Skellington from Tim Burtons’ The Nightmare before Christmas over in Frontierland with “Jack and Sally’s Cemetery” with a scary photo-location with the most “frightful” view of the eerie Phantom Manor. Are the villains too scary for the little ones? Well don’t worry, as you can meet many of the original characters you love and adore around Main Street U.S.A! Every day you can meet either Minnie or that mischievous alien Stitch at Costume Corner in their Halloween costumes, over in Town Square you can visit Goofy with his Bonbon machine, or over by the boarding house you can say hello to that beautiful little kitten Marie with her cute orange bow! Also don’t forget to join the Dr Facilier and the other villains in the amazing night-time show; ‘Disney Illuminations!’ every night on Sleeping Beauty Castle. Love the night of the 31st? 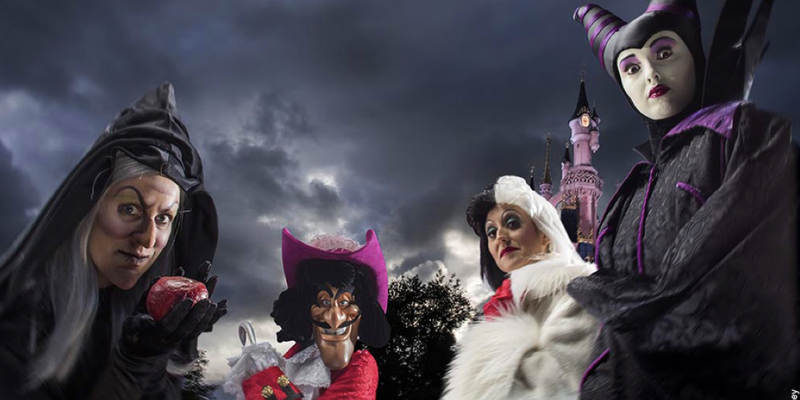 Then come and celebrate with Mickey and the Disney villains during the Evening Soirée! From 5pm come dressed up as your favourite character, from Jedi to ragdolls, to princesses and more until the Witching hour of 1am and enjoy the eerie night time atmosphere of the Soirée! Meet Jack Skellington in Frontierland or meet Tiana and Naveen as they celebrate Mardi Gras style on this one-a-year night-time event! Come join the gang for a pirate show on the castle stage with Minnie and friends! If you would like to book a spooktacular stay at Halloween, then call Holiday Hamster on 08000 988 955 where we can help you plan a magical trip to Disneyland Paris.